Escape to the woods with the world close by in this self contained non-smoking log home, including W/D. Sleeps 6 or more with innovation! The cabin, with creek nearby, offers a quality restful environment located next to public land and viewing of varied wildlife and the surrounding mountain ranges. Private hiking or cross country skiing trails are on the property and it is very close to public trail head systems. This location is the epicenter of world class hunting, fishing and skiing. 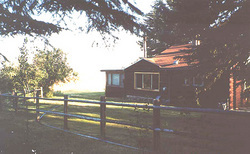 Delightful for family, hunting-fishing base, honeymooners or grown up girl sleep-overs. Directions: Beyond Yellowstone Lodging is located out of Bozeman. Frontage Road East from Airport or Interstate 90 to 19th Avenue, exit, south on 19th (approximately 8 miles) to Nash Road. Left or East through two intersections (2.3 miles) to white mailbox taking right spur to home.